No reason behind the ecstatic declaration of ‘Sushi,’ really. A year or so ago, J and J, P and I went to a sushi joint near our home. It was one of those places where the tables are surrounded by glass cases filled with aquatic life. Not my idea of a perfect dining place, mind you. However, I brushed aside my apprehensions, let J & J do the ordering, and sat back to enjoy the meal. We got a ‘boat’ of vegetarian sushi and it was fabulous. Handmade rolls of sushi rice bound together by thin strips of seaweed, some containing slices of asparagus, some with mushrooms, then some others with avocado. I loved the fresh flavors, the lovely presentation, the lightness of the ingredients. And then that place closed down. I looked long and hard for another sushi place, checked out a couple but none came close to delivering anything remotely close. Then P discovered that our old joint had reopened in the same neighborhood. And so off we went there one chilly evening. Cheerful ambience, classy decor, super-friendly and helpful server… And this time, there were no lobsters staring out at us from glass cases, yay! Fuji Hana Thai Peppers does not have a selection of vegetarian sushi on the menu. But P asked our server if the chef would be able to make us the ‘boat’ with vegetarian sushi. The answer came back, “Yes.” And so that’s what we got. 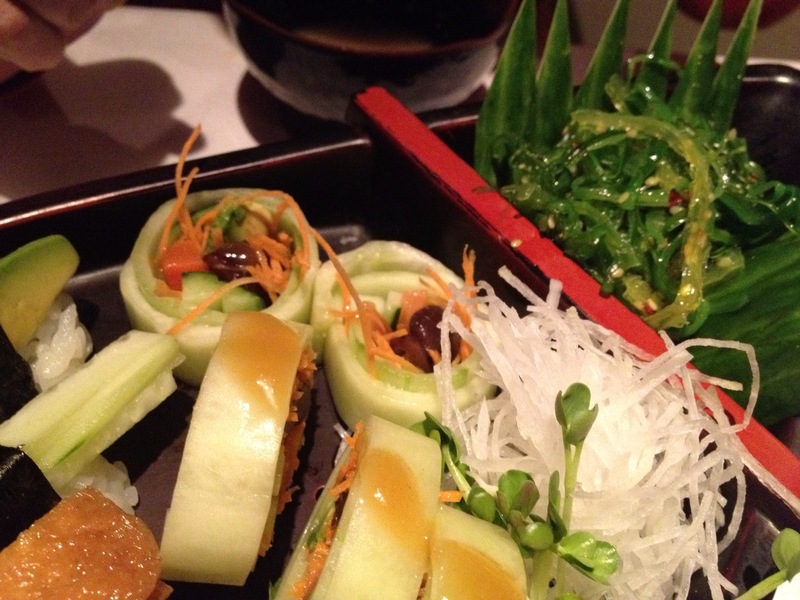 The ‘boat’ comes with a bowl of miso soup with seaweed and green salad with ginger dressing. 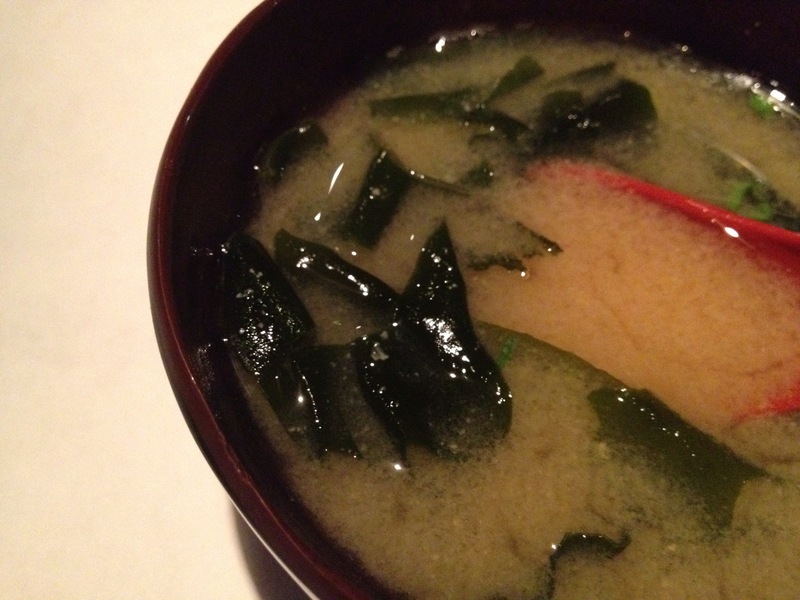 The soup was excellent, as good a version of miso as I have ever eaten. I loved the piquant ginger dressing, so sharp and vibrant. The star of the show, without a doubt, was the boat of sushi rice rolls. 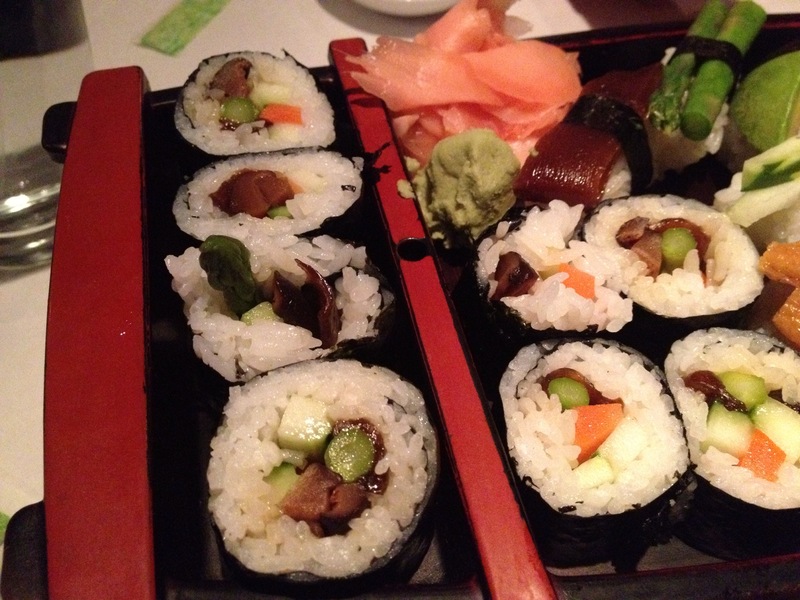 Asparagus, avocado, dates, fried tofu, mushrooms, cucumber… Yum. The chef had also made us cucumber rolls filled with shredded carrot, mushrooms, dates. Also served were glass noodles, radish sprouts and verdant seaweed salad. The wasabi was dynamite in little doses, the pink pickled ginger was perfect. It was such a sumptuous repast, so luxurious… I was happy. It is one of those moments when you are touched not simply by the flavors of the food but also by the sensation of having feasted liberally… no skimping, none whatsoever. That chef must have got a ton of blessings that night, hehe! P’s hunger was not sated yet. So he ordered a plate of Basil Noodles. I was too full but I couldn’t resist sneaking bites off his plate. It was a great plate of noodles. What can I say about Basil Noodles that does not sound tired and repetitive? Okay, at the risk of repeating myself, I must say – fresh flavors, loaded with crunchy vegetables, bright and tasty! I was fully prepared to go ahead and order the Fried Ice Cream off the dessert menu but I had to regretfully admit that it was impossible to gild this lily of a delightful meal. Fried Ice Cream, as delectable as it sounded, was given a miss. 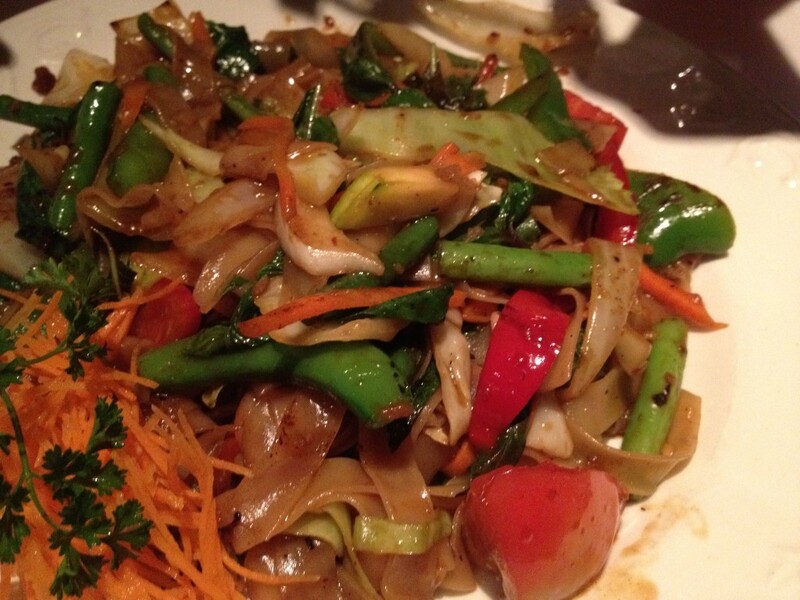 I’d go back to Fuji Hana Thai Peppers in a heartbeat. There is something about sushi’s clean flavors and how lightly it sits in my stomach that makes me a huge fan. Also, the Thai side of the menu looks promising if the Basil Noodles are an indicator of any kind. And then there is always the Fried Ice Cream, hmmm.